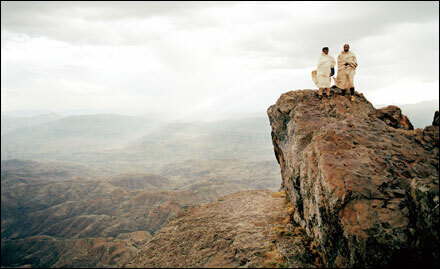 If beauty will save the world (Dostoevsky), why shouldn't you take a look at (Ethiopian) Art. Glossary of terms I use. ethio.wetpaint.com : wiki - join and contribute to Ethiopian Millennium! * Book/Project "What's in the name?" Sir Henry Rawlinson: "Recent linguistic discovery tends to show that a Cushite or Ethiopian race did in the earliest times extend itself along the shores of the Southern Ocean from Abyssinia to India. The whole peninsula of India was peopled by a race of their character before the influx of the Aryans; it extended from the Indus along the seacoast through the modern Beluchistan and Kerman, which was the proper country of the Asiatic Ethiopians; the cities on the northern shores of the Persian Gulf are shown by the brick inscriptions found among their ruins to have belonged to this race; it was dominant in Susiana and Babylonia, until overpowered in the one country by Aryan, in the other by Semitic intrusion; it can be traced both by dialect and tradition throughout the whole south coast of the Arabian peninsula." ... glossary : Ethiopiawinet -- "Ethiopianess"
Culture_of_Ethiopia [W] Culture, not cultures!? Ethiopian Studies refers to a multi-disciplinary academic cluster dedicated to the research on Ethiopia in the cultural and historical context of the Horn of Africa. The classical concept of Ethiopian Studies, developed by European scholars, is based on disciplines like philology and linguistics, history and ethnography. It includes the study of Ethiopian arts and the history and theology of the Ethiopian Orthodox Church. The classical core of Ethiopian Studies is the philology of the written sources of Christian Ethiopia and Ethio-semitic linguistics. While this approach is still alive and has its role, Ethiopian Studies have opened to a wider concept that tries to avoid a bias in favour of the Christian Abyssinian culture (Amhara, Tigrinya; cf. Habesha people) and includes the study of the southern Ethiopian cultures, Islam in Ethiopia, social and political sciences as well as contemporary issues like environment and development studies. http://zikkir.com/ethiopia/names/ from ethiopia media listing Co.?